Paul Thompson is a fifth Generation Union County Native, Paul’s family has been a vibrant part of union County since 1820 – when Paul’s Great, Great, Great Grandfather arrived from Scotland. The Thompson Family has produced farmers, builders, doctors, lawyers, educators and aviators. 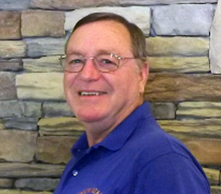 Paul started his working career in Blairsville / Union County in the fall of 1972, working as a Surveyor under the direction of the Famed Bruce Hunt who was the Union County Surveyor for many years .Mr. Hunts name is still be seen on many plats and recorded surveys today. Paul’s many experiences in the business world have prepared him to serve your real estate needs. He has been a licensed building contractor, Surveyor, developer, farmer, and automotive mechanic. Paul has been an agent/Broker for over 30 years; He was one of the first two agents who reached a sales volume of over 1 Million dollars, in the North Georgia area, receiving the Million Dollar Club status in 1991. Paul has been a constant producer since, becoming a life member in 1993, then a phoenix Member in 2002. With millions of dollars of property being sold in his career, and referrals from satisfied customers and friends, Paul will always be ready to help you achieve your dream in the North Ga and NC mountains.